The remaining useful life (RUL) estimation of a component is an interesting problem within the Prognostics and Health Management (PHM) field, which consists in estimating the number of time steps occurring between the current time step and the end of the component life. Being able to reliably estimate this value can lead to an improvement of the maintenance scheduling and a reduction of the costs associated with it. Data driven approaches are often used in the literature and they are the preferred choice over model-based approaches: in fact, not only they are easier to build, but the data over which they are built can be gathered easily in many industrial applications. 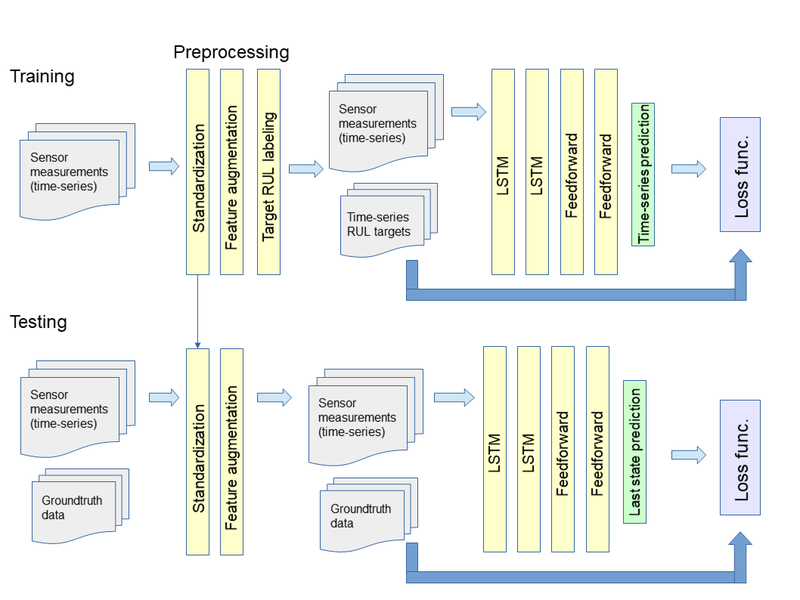 During the last years, Long-Short Term Memory (LSTM) networks have found many applications in this area because they are suitable to deal with time-series data and because they inherently learn how to remember long-term dependencies, which can be really useful to uncover hidden patterns within the sensor data. Here we are presenting a deep learning solution to the RUL estimation problem based on LSTM Networks. We are benchmarking our solution using the well-known NASA C-MAPSS data set (Turbofan Engine Degradation Simulation Data Set). We also plan on testing it within the PHM08 challenge.